Quadruplets are a set of four offspring born at one birth. An individual that is part of such a set is called a quadruplet and sometimes referred to as a quad. Quadruplets can be fraternal (multizygotic), identical (monozygotic) or a combination of both. Multizygotic quadruplets occur from four unique egg/sperm combinations. Monozygotic multiples are the result of a fertilized egg that splits into two or more embryos. It is possible for a split to occur more than once, producing monozygotic triplets or even a rare set of monozygotic quadruplets. Fully monozygotic quadruplets are rare, representing only one in about 13 million pregnancies. According to research from an organization supporting mothers of super twins (Raising Multiples: a MOST Community), more than half of the families registered with their organizations are a combination of monozygotic and multizygotic individuals. Quadruplets can be all male, all female, or a combination of both. Monozygotic quadruplets will always be of the same gender. In January 2008, a Maryland mother gave birth to a set of quadruplets that included three identical triplets. Two embryos were transferred to the mother, and both were successfully fertilized. One of them split, then split again, creating the identical triplets. Hospital officials said that there are fewer than 100 documented cases of "identical triplets plus one" in the United States. Two hundred and forty-six quadruplets were born in 2014, the latest year for which data is available. Spontaneous conception of quadruplets is rare. The MOST (Mothers of Super Twins) organization estimates the odds at 1 in 571,787 pregnancies. Most recent quadruplet births are the result of assisted reproductive techniques such as fertility enhancing drugs or in-vitro fertilization. Multiple Births Canada (MBC) estimates that 90% of quadruplet pregnancies are the result of fertility assistance. 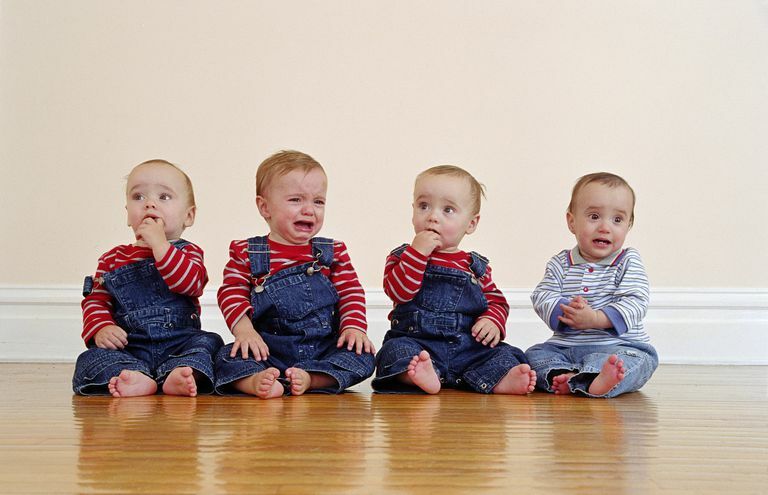 Quadruplets do not always share the same birthdate. A delayed interval delivery (also known as iatrogenic asynchronous birth) may mean that individual babies are born days or even weeks apart. The average gestation for a quadruplet pregnancy is 19-31 weeks, as opposed to 40 weeks for a full-term baby. During a pregnancy with quadruplets, a mother will gain 40-100 pounds. According to MOST, the average weight gain is over fifty pounds. One-quarter of mothers will require cervical cerclage, a surgical procedure in which the cervix is sewn shut to prevent preterm labor. Most quadruplet pregnancies result in a cesarean delivery; less than 3% of quadruplets are delivered vaginally, according to MOST. The average birth weight of a quadruplet is about 3 1/4 pounds, and most quadruplets receive medical care in a hospital NICU (Neonatal Intensive Care Unit) for an average of one month after they are born. In a survey conducted by MOST, the state with the highest population of respondents who reported quadruplets was New York, followed by New Jersey and Pennsylvania. There are about 3500 sets of quadruplets worldwide; only 60 or so are identical or monozygotic. Parents of quadruplets will change close to 30,000 diapers before their kids are potty trained. The incidence of quadruplet birth rose more than 400% in the last quarter of the 20th century, but rates have declined somewhat in the years since 2000. Banner Good Samaritan Hospital in Arizona is believed to have delivered the most sets of quadruplets, over 100 sets. Four-seat quadruplet strollers are available and are a convenient – though pricey – option for transporting quadruplets. One of the most prevalent brands is from Runabout, a company that crafts multi-seat tandem strollers with hand-welded steel frames. They are quite expensive, costing nearly $1,000 new from the manufacturer, but may also be available on the secondary market. Another option is the Foundations Quad Stroller, a more portable umbrella-style stroller. This model is cheaper, lighter in weight, and collapsible, but much less rugged than Runabout models. "Quadruplet Profile." Medical Birth Survey Data, Raising Multiples: A MOST Community. Hamiton, B.E., et al. "Births: Final Data for 2014." National Vital Statistics Report, December 23, 2015.